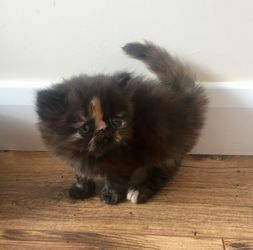 Beautiful fluffy Persian kittens, torties x 2, red x 1, black x 1 available and ready for their forever homes at 8 weeks. They will leave fully inoculated. Litter trained. Vet checked x 2, neutered, weaned and wormed. From PKD negative and SACC registered parents.